This week our book tour continues across the Carolinas and Alabama. 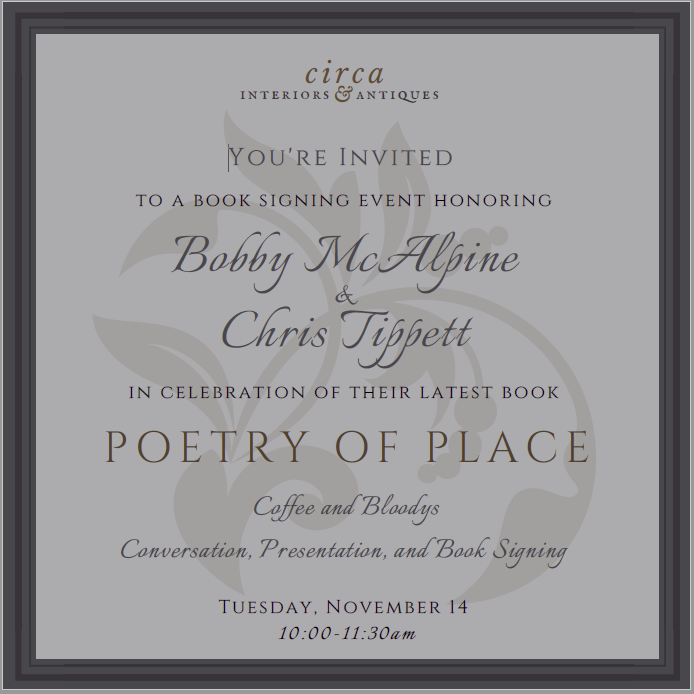 Bobby and Chris will be together with our friends at Circa Antiques and Interiors in Charlotte on Tuesday, November 14th from 10AM to noon for a talk, book signing and sharing a good time. Please join them. Bobby will be doing a book signing at Fritz Porter in Charleston at 10AM (email: info@fritzporter.com). Fritz Porter is located in The Cigar Factory, a stunningly renovated and re-purposed historic structure. This event is organized by our wonderful friend, colleague, and client Sarah-Hamiln Hastings. McALPINE partner David Baker, Sarah-Hamlin’s project architect and the architect of our most recent Charleston projects, will be on hand to greet everyone. Bobby’s three-time co-author, Susan Sully, will be around too. Susan makes her home in Charleston, and we are delighted she can be with us. And don’t leave Charleston too soon. That evening at 6:30PM, Bobby will be lecturing at the American College of Building Arts, an amazing institution training exceptional master craftspersons. The Fritz Porter crew will be on hand to sell a few books if you missed their AM soiree. Now on to the lovely artful community of Fairhope, Alabama. Jovial and entertaining McALPINE partner John Sease will be lecturing and signing at the Page and Palette at 6PM. John is looking forward to seeing all our friends in the area and meeting new ones. This is going to be a great event and not to be missed. We will take a little break for Thanksgiving then head on to New Orleans and Houston. Can’t make it to one of our events? Order your autographed copy from our friends at Christine’s Feathered Nest.